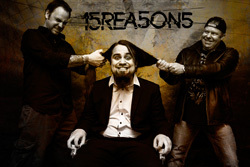 Coming from Brussels, 15 Reasons is essentially a modern heavy rock power trio, offering their third album, The Art of Commitment. They draw influences from Metallica and Alice in Chains to Stone Sour and Godsmack, which should suggest something interesting. 15 Reasons: to pull out his hair. And at first I thought so, but after several listens, excepting a few songs, The Art of Commitment isn't all that compelling. Rather it's almost vanilla. The majority of songs are just riff monsters built upon basic chord structures. Damage Done, N.B.M.A., Humans Are Pollution, Around Me, Worm Inside, and Mirror Mirror, by example, are merely heavy and crunchy as they thud along like a plodding golem. For the first four, you have to wait for the end of Humans Are Pollution for any resemblance of a guitar solo. The likely best part of any of these songs is Nicholas Brynin's vocals, which are strong and emotional. But then there's The End of Everything and The Art of Commitment, an instrumental, the odd balls of the bunch. They sound nearly like modern progressive heavy rock. They have more depth, spirit, and creativity then any of the other songs. And you get to discover how good a guitarist Val�ry Granson really is. He's not merely building a wall of riffage with his guitar, but truly making it sing. If the other nine songs had the strength and depth of these two, then this album would been much more interesting and entertaining, even bordering on terrific. 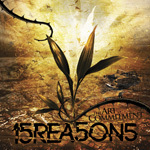 15 Reasons's The Art of Commitment is essentially a menu of heavy and crunchy heavy rock riff monsters, with a few wild cards of more interest.